The Kentucky Building was originally designed as a 40,000 square feet Georgian-Revival style structure. It included reception areas, classrooms, museum galleries and library reading rooms. Construction of the building began in 1931 but due to the Great Depression, only the exterior was completed. The half finished building provided classroom space. President Cherry died in 1937, two years after launching a second fundraising campaign to have the building finished. President Paul Garrett, Cherry's successor, hired James M. Ingram to complete the interior of the building. The Kentucky Building officially opened in the fall of 1939. The building was dedicated on November 16, 1939, Dr. Cherry's birthday. The Kentucky Building is 184 feet wide and 50 feet deep. It is two stories high with a full semi-basement. The central room of the first floor is the general reception room. The style and arrangement is typically Kentuckian. With its high ceiling, beautifully paneled woodwork, open fireplaces in each end of the room, the reception room offers an unusual, spacious and handsome appearance. It is expected that ultimately it will be completely furnished in period furniture and that portraits of Kentuckians who have played an important part in the founding and development of our commonwealth will adorn its walls. From this beautiful reception room one passes on this floor to the north wing which is occupied by the Kentucky Library. here we find the office of the librarian and her assistant, a work room, a newspaper filing room and a beautifully equipped and commodious public reading room. Under the original plan this was the only space set aside for the library; however, it has had such a phenomenal growth both in volume and importance that it was necessary to devote the top floor of this wing to the library. the two floors are connected by a book life and a stairway. On the top floor are to be found stacks sufficient to house accumulations for many years to come and a rare book room. The space over the reception room and the top floor of the south wing are devoted to the Kentucky Museum. here have been collected, cataloged, and displayed specimens related to geology, life and customs of the several periods of Kentucky history. Of special interest is the display of mounted specimens of native bird and wild animal life indigenous to the state. 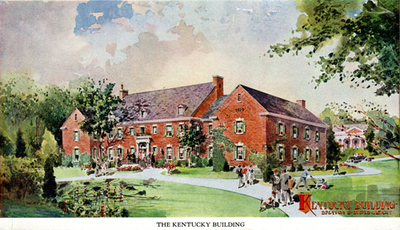 The new accommodations will make it possible for the college to add a vast amount of materials to its present collection, organized and classified so that it will be a usable Kentucky laboratory for the instruction not only of the college students but also the high school and grade students in this area. The rooms on the ground floor and first floor of the south wing, which include a splendid kitchen, have been set aside for the use of faculty members and the many student organizations of the college for their meetings and social gatherings. It is intended that this wing together with the general reception room will become the social center of the Hill. There also are to be found on the ground floor work rooms for the museum, a classroom for the teaching of Kentucky history and Kentucky geography, as well as offices for the College Heights Herald, the alumni secretary, the curator and the secretary of the College Heights Foundation. In 1977 the building was renovated and expanded to over 80,000 square feet. The addition houses new gallery space for the museum and a library reading room. An interior courtyard between the original building and the addition was also created. The Kentucky Building was closed for three years during the construction.